This is my last blog post before Christmas. I waited until today because I wasn’t sure if the world was ending or not. Looks like we’re good to go! 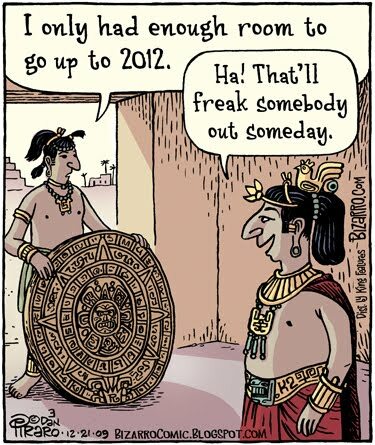 I guess the Mayans weren’t great at making calendars after all. I thought I would share some Christmas projects I designed for Canadian Scrapbooker. First up….here are 3 cards I created for the Winter issue 2012 using Bo Bunny‘s Mistletoe collection. Love these bright cute papers! I added Robin’s Nest Dew Drops as ornaments on this tree. Aside from some lace and pom pom ribbon, I didn’t do much else except cut the papers. Their adorable Christmas images are perfect for simple cards. On December 11, I had a blog post over at Canadian Scrapbooker about a Christmas card I made with Stampin’ Up! products. The tree is made with folded doilies cut with a Stampin Up Sizzix die. Click HERE to visit the Canadian Scrapbooker blog post with the details and photos of how I made my card. 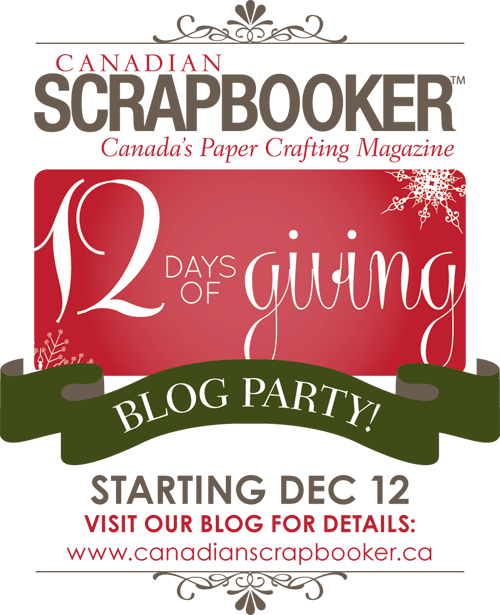 Right now there is a HUGE contest over at Canadian Scrapbooker called “12 Days of Giving”. Every day you can enter to win a prize package from a different sponsor! Click HERE to check it out. I designed two Christmas projects for this contest, using Fancy Pants “Home for Christmas” and My Little Shoebox “Winter Wonderland”. 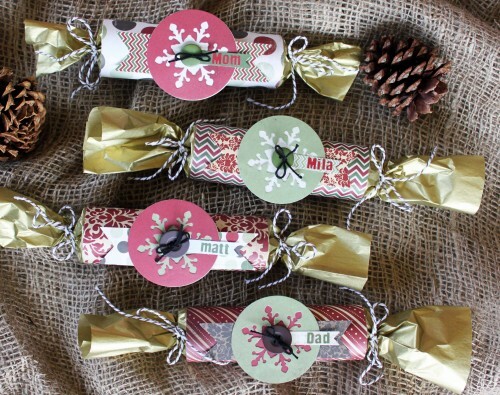 I made Christmas crackers with the Fancy Pants papers for Day 3 of the contest…. They are super simple to make…. Cut an empty paper towel roll in half. Measure and cut your patterned paper to fit around it. Put SookWang double sided adhesive tape (1/4″) at top and bottom edges of the paper. Put a second strip of adhesive tape under the top strip (this will hold the tissue paper in place). Remove the backing from the second piece of tape along the top.Cut a wider piece of tissue paper that extends about 4 inches past each side of the paper/roll. Centre the tissue paper edge on that exposed adhesive strip. Now remove the remaining top and bottom adhesive strips and wrap paper with tissue around your empty roll. Almost done….just tie one end with twine, fill with prizes and goodies, tie the other end and decorate the top! For my second project on Day 4 of 12 Days of Giving, I designed an Advent Garland using My Little Shoebox “Winter Wonderland” collection. I bought the pretty iridescent silver garland at Canadian Tire, and I found the clothespins in Hobby Lobby in the States. Each pocket is basically a rectangular piece of patterned paper, folded in two places for the body and the top envelope part. One of the pieces of MLS papers had all of the numbers 1 – 25, which I cut out and adhered to the front of the pocket envelopes. I added stickers from their sticker sheet to decorate them a bit more. In the pockets I put chocolate gold coins….but I think my teenagers would prefer the real thing! It’s not too late to win a prize package over at Canadian Scrapbooker! Stop by there and check out all the fabulous projects made by the rest of the Design Team using all of the papers and products from contest sponsors! Click HERE and enter to win yourself a Christmas present. 10 Comments on A Merry Christmas to All! Kelly I just love all your projects. You so amazing at coming up with unique projects. I am in love with your advent idea. I can just imagine a whole tree filled with those lovely cards. Just perfect! Have a wonderful Christmas and a blessed New Year! These are all wonderful Kelly! I always looks forward to seeing your creations. You inspire me so much! Have a great Christmas! Super cute projects Kelly! Hope you and your family have a very Merry Christmas! 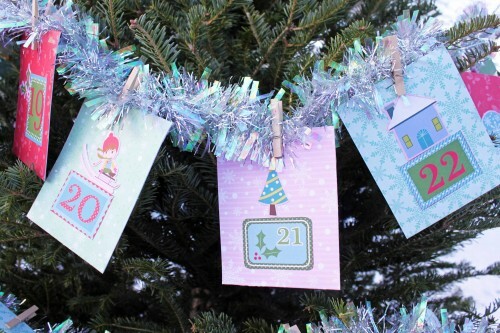 A reversible Advent garland? Why, you’ve outdone yourself, Kelly! Everything turned out beautifully. I love and adore your doily angel. 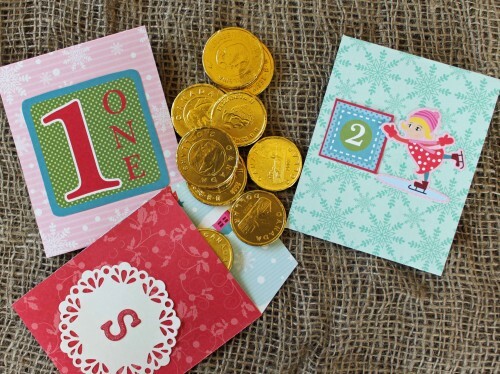 Your Christmas cards are so cute and how fun are those Christmas crackers Great post. Love the cartoon too. LOL. I hope you have a most wonderful holiday, my dear friend. Oh my goodness, Kelly! I love all of your projects so much. Thanks for sharing them with us, and for telling us how you made them, too! You are awesome!!! I would like to wish you and yours a very Merry Christmas! And a happy New Year, since the world did not come to an end!!!!!!! Thanks for all you do! I love your cards (both trees) and the crackers. I made those for Bob’s Mom’s 80th birthday…(saved toilet paper cardboard rolls). She was a “Maxine” and loved Crabby Maxine, so I was able to use some of the Hallmark goodies for that. great projects Kelly! I think I see “my ‘ Christmas card here lol! Great tutorial Kelly! You always make things so crystal clear and easy to follow! Christmas hugs! Your projects are all so beautiful, and I really appreciate that you take the time to explain how to recreate them!!! Hope your Christmas was wonderful!